If shows you can pause, rewind, analyze, and speculate about until your brain explodes are your thing, stop what you’re doing and go watch the new Netflix series Dark. 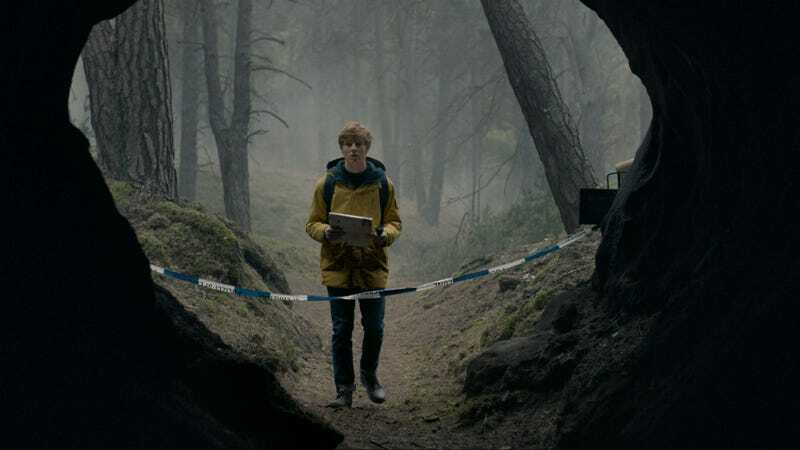 The 10-episode show debuts today, and it’s kind of a gloomy version of Lost crossed with It set in a small, quiet German town named Winden in 2019. A boy has gone missing, which turns everyone in the community on their heads. Then another boy goes missing. At the same time, there are some mysterious strangers walking around town, and a man who recently died left a note to only be opened at a very specific date and time in the future. It’s very Doc Brown. Basically, the entire story is built around mysteries: Where are these missing kids? Why is this happening in this town? The show continues to give us lots of very specific and intriguing bits of information, and then we wait with baited breath as the characters slowly begin to discover or unravel the answers for themselves. Thanks to the small-town setting, all of the characters are very closely connected, which adds another intense level of drama. For example, the main character’s mother is sleeping with the police chief. The police chief’s wife is the principal of the school attended by all the kids, and her daughter is the girl the main character has a crush on. Things like that. It’s maybe too incestuous and coincidental, but the way everything else is playing out around it, you get the sense there’s much more to their relationships—especially in terms of the unfolding narrative—and that this is on purpose, but it’s impossible to know, at least in the beginning. Either way, it makes for captivating melodrama to go along with this odd mystery they’re all unknowingly involved in. io9 received the first three episodes, where we don’t really learn much about the missing kids, but we do very quickly learn the show has something to do with time travel. While most of the show takes place in 2019, chunks of it take place in other time periods, too, so we see characters not just as they are in present day, but in other times of their lives, played by different actors. And in 2019, some of the characters rant that what’s happening has happened before. It’s truly a gripping set-up. One knock against the show though is the pacing. It’s incredibly slow, at least in the first three episodes. The story is continually interesting as it inches ahead but there aren’t many big set pieces or action beats to punctuate everything. It’s show you must watch while alert, not just because of the way information is steadily leaked out, but because of its muted style and storytelling. If you aren’t on your toes, Dark could rock you to sleep. Then, of course, there’s the fact that the show is subtitled, something that’s fairly unique for Netflix original programming as this is its first German series. It doesn’t change the story one bit but I know subtitles are a deal breaker for some. All that said, after watching only three episodes of Dark, I already want to rewatch them. Even in those first few episodes, things are already building up in exciting ways, With seven episodes to go, if this level of craftsmanship continues, Dark is going to be a show its viewers will be debating—and lauding—for a long time to come.